A word of advice to all aspiring tower-hunters: don't bother trying to get to this site. Make friends with Bob Shotwell and let him take you. I did it the hard way, and it was not something I'd subject my vehicle to again. The two broadcast facilities on this hill, at the end of a very long unimproved road, are Deerfield Academy's WGAJ (91.7 Deerfield), which signed on in the early 1980s, and WRSI (93.9 Turners Falls), which Shotwell built as WPVQ about ten years later. When I was up here, I thought both were on the same tower (and figured the circular element at lower right to be 91.7), but on further investigation, that appears not to be the case. 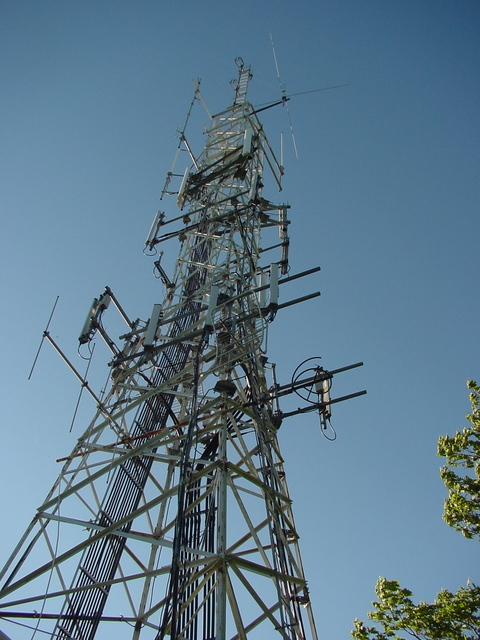 Mike Fitzpatrick has a photo of the WGAJ antenna on his site. This tower overlooks Deerfield's single-T-bar ski hill.